It’s a new year and we all have resolutions to go with it. As writers, we hope to make time to write every day. That’s the goal, right? As a writer, your one job is to write! But then there’s the family, your day job, the cat poking at your chair, the dog needing to go out, and you haven’t called your parents back yet. Balance is something that I’m always at odds with. Thankfully, I thrive with change. And there’s been quite a bit of change in the few short weeks of 2015. Meredith ran away to Mexico and got married. Huge hugs and congratulations to the newly weds. 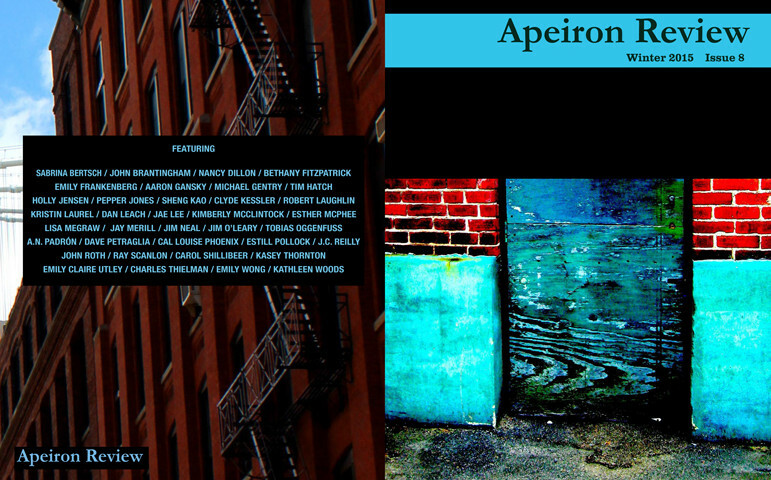 Thankfully, they’ve returned to Philadelphia, and Apeiron continues! Apeiron-related updates: we’re still determined to grow as time passes. We’re struggling to sort out just how we move from digital to print, and that’s meant adding staff and shuffling job functions. With this issue, we were blessed with a talented team of first readers. For those unfamiliar with how submissions are processed, our “slush” team reads all incoming submissions and notes their thoughts. All submissions are then bumped up to Meredith and me to read and review. You might not think that this process would be so helpful, but it is. Thanks to our growing staff, our turnaround time has increased drastically and we’re able to give more feedback. It’s always frustrating when you wait months to hear back from a submission. I think Meredith’s had one out for well over 6 months now. So, thanks go out to our First Readers! Changes coming in 2015 shouldn’t be immediately noticable to readers. I’ll be attempting to grow our online presense, and I’ll have much more time to spend on making the layouts pretty and such. The hope is that I’ll finally develop the ability (confidence) for a print run. Maybe one more issue (yes, I keep saying that), and we’ll give it a go. So keep your eyes peeled for a call for submissions for an actual paper copy. Plant a tree in preperation. This issue showcases many seasoned and debut writers. Take your time with this one. Find “the space between the pauses” within this issue (Wong, 42). Speak to the hermit crab and listen what he has to say (Reilly 63). Learn how different parents love their children. I won’t share how Sabrina Bertch’s photograph, “Self,” makes me feel, but I will say that I’d hang it on my wall (See p. 52). I believe our youngest author in this issue is 16 years old. Crazy, right? As you follow through with your new year’s resolutions, we hope to see your thoughts and submissions in our inboxes. As always, we want your dreams, fears, hopes, wrath, and maybe even your drunk dials—but in print. Let’s keep it to print. You can read Issue 8 on Scribd online or download the app.